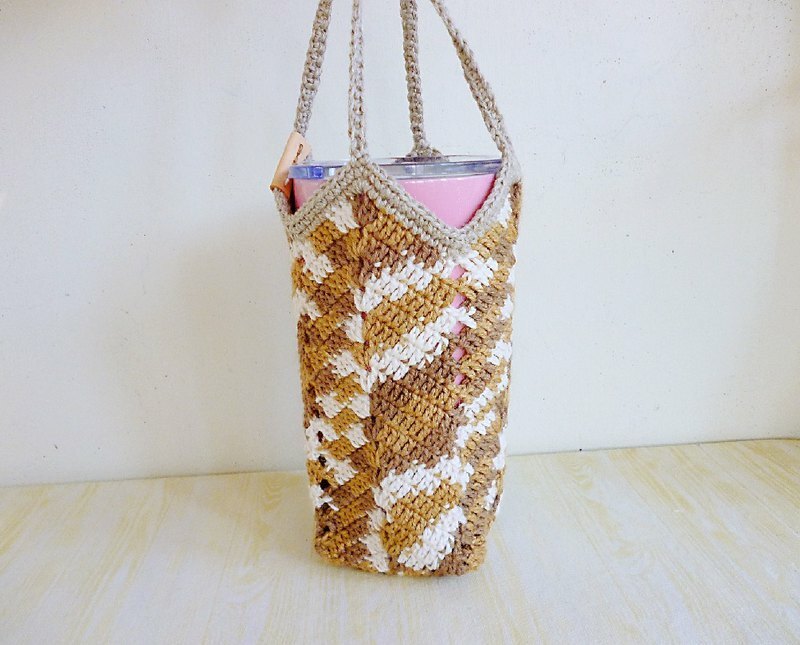 [product design features] ◎ Use the thickest multi-strand ramie thread to hand-knit a woven bag with a needle and a hook. The solid hook has a certain thickness! ◎ The ramie line is a natural ramie fiber, which has the same moisture absorption and quick drying characteristics as the general hemp rope. ◎ The texture is more lustrous and meticulous than the hemp rope, and the touch is softer and not tied. ◎ It can be used as a cup bag or a kettle bag to bring your own tea. You can also fold the storage bag and go out to buy a drink. ◎ General hand shake drink, ice cup, mason bottle, vacuum cup, 26 cm high vacuum flask can be used. ◎ The hook bag is slightly elastic. The bottom of the bag can be placed with a diameter of 8~9 cm. The square or round bottom can be stretched in the upper part. ※ The first use will be tighter! 【 Size】 Flat non-stretching diameter: about 8cm at the bottom of the bag, about 15cm wide at the bag, and about 20cm without the handle (within 1~2cm error) ※※**Flexible crochet stretchable** ※**If you are not sure if you can use the bottle at hand, you can use the message designer** [Material & Washing] ◎ ramie ◎ Please use a neutral detergent to clean the local dirt. Slightly dirty and then soak the bag into cold washing or neutral detergent aqueous solution, clean it by extrusion, and then squeeze into clean water to squeeze The way to clean the bubble, put it flat on the towel to press the water out and dry it under the sun. ◎ Do not immerse the bag body, do not soak. [Flower rabbit hand made the original intention and small 叮咛] ◎ Hand works and the transmission of love is the original intention of the flower hand rabbit to start selling hand works. ◎ Resale income is used in feeding and rescue waves. ◎I wish to make the world a better place with the power of small bean sprouts~ ◎ Hand sewing with one stitch and one stitch may have some imperfections. ◎Everyone has different screen settings, so the actual product and the screen display may have a slight color difference. ◎Handmade, perfectionist for color and work, please think twice before buying. ◎On Saturdays and Sundays, the family day and materials procurement will be processed for one day, and will not be shipped (except for special orders). ◎ Part-time non-exempt orders, if there is a specified time limit arrival date, please confirm the order before the order, do not place the order directly, can not be allocated a reasonable meeting. ◎ Non-24 hours online, please contact us if you have any questions, wait patiently, and you will reply and deal with it in the first time!